Craig Westcarr celebrates his Wembley goal. It is something that football fans of all clubs argue about. What is the best, most memorable or favourite goal scored by your heroes? Each week we will take a look at some of the best to hit the net for Chesterfield over the past decades. If you have a goal you would like us to feature, email sport@derbyshiretimes.co.uk with brief details and your memories of the strike and we will try to include in a future article. Craig Westcarr with the trophy. Already we have had requests to feature Derek Niven’s 96th minute winner against Bournemouth in the last match at Saltergate and Jamie Hewitt’s header against Middlesbrough in the FA Cup semi-final in 1997, among others. But this week we start with another memorable Spireites goal and a Wembley date for the fans. 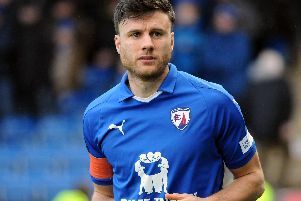 It was nominated by Kurt Bigg and was a red letter day for all Spireites — even if 25th March, 2012 was one of the few highlights in a disappointing season. John Sheridan’s men had won promotion and the League Two title the previous campaign, but they struggled in League One during 2011-12. However, the Johnstone’s Paint Trophy provided much-needed relief for the fans, who had seen the bottom-of-the-table Spireites win just seven of 38 league games going into the JPT final — and none of their previous 17 league matches — at the new Wembley. The hero was super substitute Craig Westcarr with a real golden goal, netting deep into injury-time to seal a famous 2-0 win over Swindon Town, then in League Two, to claim Chesterfield’s first ever win at the home of football. With the blue shirts clinging on to a narrow 1-0 lead, courtesy of a 47th minute own goal, Westcarr struck. The striker, a first-half substitute for injured favourite Jack Lester, had already fired wide when clean through, but this time he made no mistake. Westcarr timed his run perfectly to collect a hopeful clearance as he raced clear of three defenders from just inside the Swindon half. He then kept his cool to side-foot his finish under advancing keeper Wes Foderingham, before whipping off his shirt and waving it above his head as wild celebrations began. Westcarr recalled his big moment again last summer, saying: “I remember not making the starting line-up but thinking I would get a chance at some point, and then Jack Lester got injured early on. “I was excited but my whole body felt tight for the rest of the first half. I relaxed a bit after the break and obviously we ended up winning it. “It was one of the best memories I’ve had, it’s a great day out. Chesterfield keeper Tommy Lee recalled the day in his Derbyshire Times column last year. He said: “Without question, my most cherished memory came in the Johnstone’s Paint Trophy final against Swindon. I had the best seat in the house to witness Craig Westcarr slide the ball past Wes Foderingahm and send 20,000 Spireites in to delirium. It’s the best feeling I have ever experienced on a football pitch. High-profile Swindon boss Paolo di Canio was not happy after the Wembley final. Chesterfield rightly couldn’t care less. Sadly for the fans, the trophy triumph could not halt the slide towards relegation. The next three league games were lost to all but seal Chesterfield’s fate and, despite three successive wins, defeat in the last two matches sent them straight back to League Two. When the opening four matches of the following season also failed to produce a win, Sheridan was sacked. It was a sad end after the earlier promotion and Wembley glory. There was also a sad end for Westcarr. He had joined the club from Notts County at the start of the 2011-12 season and scored 11 goals, including the Wembley strike, in 43 appearances during the campaign. However, he didn’t find favour under new boss Paul Cook and after just three further goals Westcarr left for Walsall, where ironically he netted the club’s goal of the season — a 30-yard thunderbolt. It was a spectacular strike but not as precious as his Wembley winner.